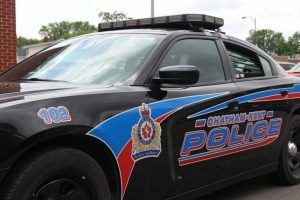 A 36-year-old Chatham man was located in Chatham and arrested in relation to an indecent act Saturday at around 10:40 a.m. Police say the man was released with a court date following the arrest. At around 8 p.m. the same man was seen fleeing a break and enter and arrested. The man reportedly had a small amount of suspected methamphetamine in his possession. Police are investigating after a Chatham pharmacy was broken into Sunday. The Chatham-Kent Police responded to an alarm going off. The pharmacy was checked and it was determined that someone gained entry to the pharmacy from an adjoining business. This business showed signs of a break and enter as well. Several items were removed once the suspect gained entry; however no prescription medication is believed to have been stolen. Police responded to a break and enter at the Clearville Park Campground on Friday. Several sheds were broken into and there are currently no suspects. Anyone with information regarding this incident are encouraged to contact Constable Brad Molnar at bradleym@chatham-kent.ca or 519-436-6600 extension #86444. Anonymous callers may call Crime Stoppers at 1-800-222-TIPS (8477) and are eligible for a cash reward. Police responded to a break and enter to a residence in Blenheim on Friday. The back door to the residence was kicked in and nothing is believed to have been taken at this time. There are currently no suspects. Anyone with information regarding this incident are encouraged to contact Constable Ken Koke at kennethk@chatham-kent.ca or 519-436-6600 extension #87178 Anonymous callers may call Crime Stoppers at 1-800-222-TIPS (8477) and are eligible for a cash reward. A 31-year-old woman was arrested on an outstanding warrant early Saturday morning. Police say the woman was turned over to the Chatham-Kent Police by Leamington OPP and she was arrested on an outstanding warrant for the offences of Threats, Unlawful Confinement, Mischief x2, Breach of Recognizance and Fail to Attend Court x2. Early Saturday morning a woman was turned over to the Chatham-Kent Police by Middlesex OPP and she was arrested on an outstanding warrant for the offences of Theft, Possession and Fail to Appear. The 28-year-old female was arrested and transported to police headquarters. She is in custody for a bail hearing.